Hi. 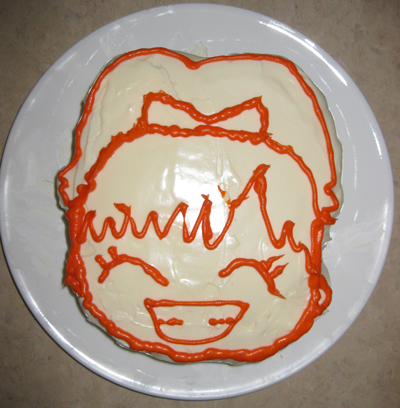 I made a cake. Happy 3 Years International Wota. Wait, now how am I supposed to eat this. I didn’t really think that far… Hmm, well I guess I can eat it with a fork ( -_-) Oh, there’s a “3” in there if you look hard enough. 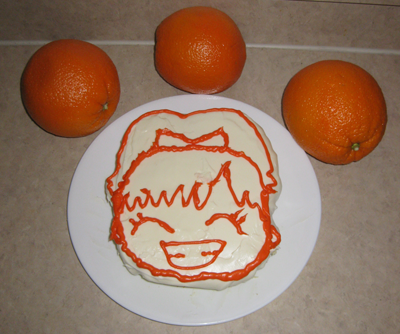 The big oranges make the cake look small. Anyway, thanks International Wota for continuing to spread Japanese music to the masses and working on connecting the community of bloggers out there. See ya next year. By all means, help yourself! Looks most pretty~*….I'd say yummy but cake scares me still lol XD! You're really great with decorating too and I adore that you chose Chiichan's personal drawing for Cake♥Day!…I have that same drawing of her's on her cap from awhile ago…=)!